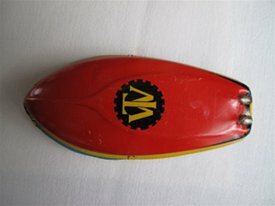 I have had two pop pop boats in my collection for some years now, that are very similar to look at. 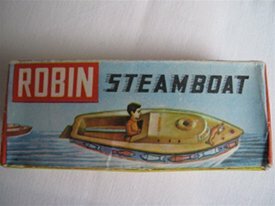 The most recently produced one (see above), manufactured by Welby Impex in India, is still being made today and bears the word "Robin" on the upper deck. Below are two pictures showing the box and the logo on the hull. The older one (see below) was also produced in India and bears the word "Anand" on the upper deck. Probably made around the 1960/70's, it is easy to see how the "Robin" reproduction has been created (or could we say copied!). The pictures below show the box and the logo on the hull. Anand, by the way, is an Indian Boy's name meaning Joy or Happiness. Some months ago a fellow boat collector sent me an email with a picture attached. At first glance I almost dismissed it, as a shabby example of one of the aforementioned craft. However on close examination I realised that it must be the forerunner of the other 2 boats. 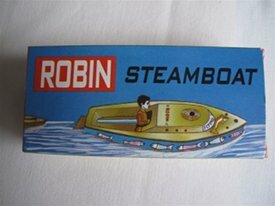 The general patterns on the boat are similar, but it bears the trademark on the hull of "GAY Miller Toys" (see above) and a similar, but worn, wording on the upper deck (see below). So far I have not been able to find out anything about "GAY Miller Toys", I assume they were a British company due to the inclusion of "Regd Trade Mark". 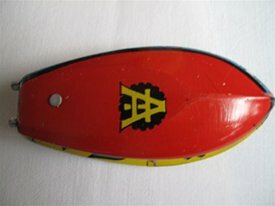 Can anyone shed any light on this manufacturer? So the moral is, look very carefully at your steam toys, similar is not the same!